Most of my plates and cups are plain white. I like to keep it simple. 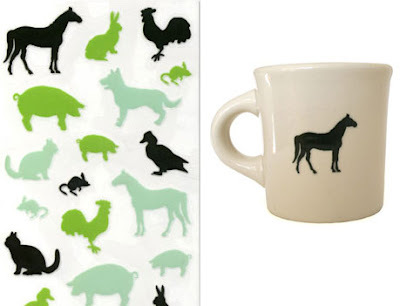 I also like the idea of using these Farm Animal Decals on them to spice things up every once in a while. They'll stay on through the washing but you can still peel them off when you've tired of them. These could also make a great stocking stuffer. ALSO I just realized that I love the idea of using these instead of those 'charms' for keeping track of your glass at a party. How awesome would it be to have a rabbit on your wine glass?